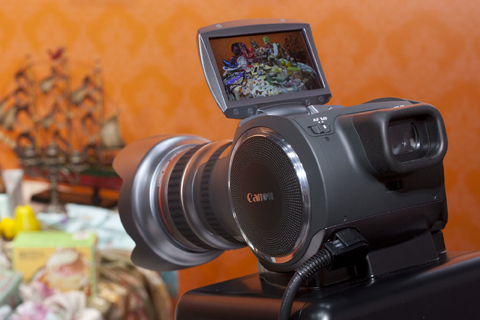 Canon has showcased a 'concept' camera capable of shooting still images at a frame rate exceeding 60 shots per second. Canon has showcased a ‘concept’ camera capable of shooting still images at a frame rate exceeding 60 shots per second. On Tuesday Canon said the model would come with a new 8-million-pixel CMOS sensor and be capable of shooting video with a resolution four times greater than Full HD. Described by the firm as ?compact and lightweight? it would have a fixed 20x f/1.8 optical zoom, designed to deliver the 35mm viewing angle equivalent of a 24-480mm lens. The zoom would be powered by a ?new, fully electronically-controlled, lens drive system?, according to a statement released by Canon.